"In Motherhood, Sheila Heti asks what is gained and what is lost when a woman becomes a mother, treating the most consequential decision of early adulthood with the candor, originality, and humor that have won Heti international acclaim and made How Should A Person Be? required reading for a generation. As it happened in previous Bout of Books, in this post I will state my goals as well as update my progress throughout the week. Time devoted to reading: 30 minutes Number of pages read today: 10 pages of Motherhood, by Sheila Heti Total number of pages read so far: 10 pages Notes: I am almost finished with this book, but unfortunately I didn't have the time to read more than what I have read. This post will be in English and in Portuguese. 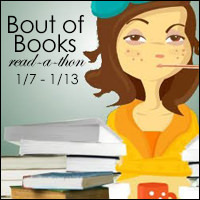 The Bout of Books read-a-thon is organized by Amanda Shofner and Kelly Rubidoux Apple. It is a week long read-a-thon that begins 12:01am Monday, January 7th and runs through Sunday, January 13th in whatever time zone you are in. Bout of Books is low-pressure. There are challenges, giveaways, and a grand prize, but all of these are completely optional. For all Bout of Books 24 information and updates, be sure to visit the Bout of Books blog. - From the Bout of Books team. Aqui fica o post habitual onde irei actualizar as minhas leituras do ano. Mais um ano que acaba, outro que está prestes a começar e, por isso, mais um post da praxe sobre balanços do ano que finda e planos para o ano que irá começar. Título: The Ministry of Utmost Happiness Autor: Arundhati Roy Editora: Hamish Hamilton Páginas: 464 Sinopse: "The Ministry of Utmost Happiness takes us on a journey of many years-the story spooling outwards from the cramped neighbourhoods of Old Delhi into the burgeoning new metropolis and beyond, to the Valley of Kashmir and the forests of Central India, where war is peace and peace is war, and where, from time to time, 'normalcy' is declared. The Ministry of Utmost Happiness is at once an aching love story and a decisive remonstration. It is told in a whisper, in a shout, through tears and sometimes with a laugh. Its heroes are people who have been broken by the world they live in and then rescued, mended by love-and by hope. For this reason, they are as steely as they are fragile, and they never surrender. 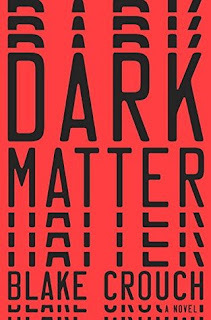 This ravishing, magnificent book reinvents what a novel can do and can be. 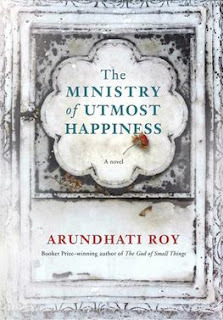 And it demonstrates on every page the miracle of Arundhati Roy's storytelling gifts." "se não te acompanham é porque te estão a atrasar..."
Diana has read 0 books toward her goal of 10 books. Papéis e Letras by Diana Marques is licensed under a Creative Commons Atribuição-Uso Não-Comercial-Proibição de realização de Obras Derivadas 3.0 Unported License.